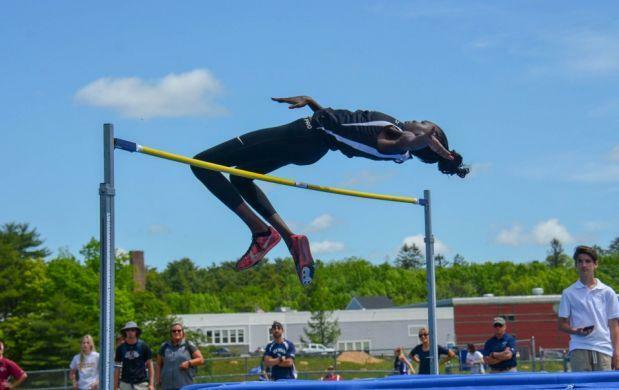 The highlight of the Class A state meet was Nyagoa Bayak of Westbrook in the high jump. Bayak cleared 5 feet, 11 inches to win and break the previous state meet record of 5-9 formerly held by Jesse Labreck who graduated from Messalonskee High School in 2008. Bayak's record-setting mark is currently the sixth-best clearance in the country. Bayak would go on to take second in the triple jump (37 feet, 4 inches) and sixth in the long jump (16 feet, 7 inches). Bayak wasn't the only one setting state records at Morse High School on Saturday. Oxford Hills's Jadah Adams won the javelin with a record-setting throw of 135 feet, 7 inches, breaking the previous state record of 131-10 set by Keila Grigware of Biddeford High School back in 2011. The Cheverus girls' scored 84 points to win their second-straight state championship, while Falmouth and Thornton Academy were awarded co-champions on the boys' side, with both schools scoring 67 points. Cheverus (64) and Scarborough (60) rounded out the top four on the boys' side, which has to be one of the closest finishes in state meet history. The Stags got stellar contributions from Emma White and freshman Victoria Bossong. White defended her title in the long jump, jumping 17 feet, 5 inches, also won the triple jump (37-04), finished third in the 100 meter hurdles (15.52) and ran a leg on Cheverus' winning 4x400 meter relay -- which ran to a state-leading time of 4:05. Victoria Bossong ran the third leg on the 4x400m relay , and took home an individual state titles in the 100 and 400. 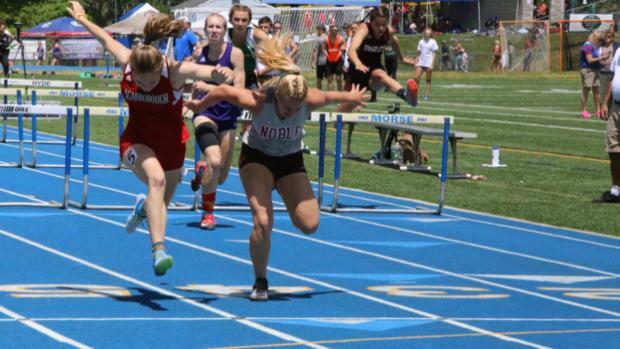 Bossong ran 12.18 (state-leading time) to take the 100, with fellow freshman, Rori Coomey of Marshwood, right behind in 12.33. Bossong then won the 400 in a personal-best of 56.95 seconds, right ahead of teammate Emma Gallant, who was a step behind in 57.43. The two also ran on Cheverus's 4x100 meter relay squad, which finished second to Thornton Academy in a time of 50.15. The Trojans were just ahead in 50.15, with Mia Taranko anchoring home Thornton Academy. Gallant would get her individual tile in the 200, running 25.57 seconds to beat Katherine Page of Marshwood, who clocked a fine time of 26.45. One of the premiere races of the day was the 100 meter hurdles, with Noble's Nina Tasker and Scarborough's Emily Labbe facing off. Labbe was able to win in a spectacular time of 14.75, with Tasker a tenth of a second behind in 14.76. The times are personal-bests for both athletes. Labbe would also run to a runner-up finish in the 300 meter hurdles in a time of 46.94 seconds. Annah Rossvall of Deering won the event in 45.85 -- a personal-best. There was another close finish in the 3200. Ami Beaumier of Bonny Eagle win the event for the second year in a row, but it didn't come without some drama. Beaumier finished in 11:23.17 with Hampden Academy's Helen Shearer right behind in 11:23.45. Malaika Pasch of Falmouth won both the 1600 and 3200. Pasch won the 1600 in 5:14.18, with Gorham's Anna Slager a couple steps behind in 5:17.22. Pasch had a closer result in the 800 as she won in 2:21.95, with South Portland's Anna Folley right behind in 2:22.38. For the Thornton Academy boys to earn a state title split on Saturday they needed great performances from Travis Snyder and Jason Montano, and that's exactly what the Trojans got. Snyder was spectacular all day, winning the 110 meter hurdles (14.96), 300 meter hurdles (41.53), and the pole vault (14-09), racking up 32 of Thornton's 67 points. 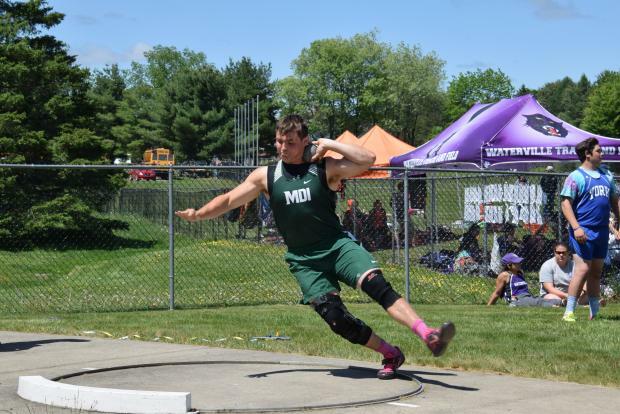 Montano took individual titles in the discus (145-07) and the shot put (55-02.75). Montano has dominated the shot put as he also won the Class A indoor title. Falmouth get several key contributions from everywhere. There were no individual winners for the Yachtsmen, but the won the 4x100 meter relay (44.16) and had many runner-up finishes. Falmouth took second to Scarborough in the 4x800 in 8:28.79 (the Red Storm won in 8:23.27) and were nipped at the line in the 4x400 by Bonny Eagle, finishing in 3:30.69 to the Scots 3:30.60. The top four in the 1600 were separated by less than two seconds, with Mt. Ararat's Lisandro Berry-Gaviria taking the win in 4:26.66. John Auer of Falmouth was right behind in 4:26.95, while Deering's Alec Troxell (4:27.14) and Bonny Eagle's Aiden Willey (4:28.13) rounded out the top four. Berry-Gaviria also took the 3200 in another close finish, as he won in 9:56.43 with Bangor's Gabe Coffey less than three seconds back in 9:59.42. Falmouth also got a great contribution from freshman Alvaro Fuentes, who finished second in the 200 (22.76) and also ran a leg on the Yachtsmen's winning 4x100 winning relay. Cheverus sophomore Sean Tompkins was right ahead of Fuentes in the 200, winning in 22.64. Auer would also finish third in the 800 (2:03.6), while teammate Douglas Cooke was second in the 400 (52.13). Hampden Academy's Wyatt Lord took the win in the 800, running 2:02.02, while Edward Little's Russell Allen was second in 2:03.21. Alex Wilkins of Windham took home two state titles, as he won the long jump (21-09.50) and the triple jump (44-01.25). 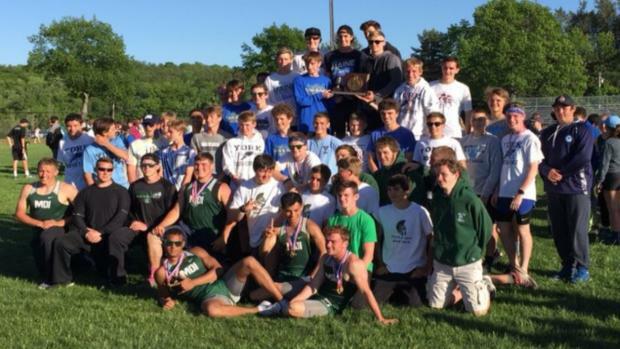 Like in Class A, the boys' team title was shared as Mt Desert Island and York each scored 86 points. Brewer (66), Hermon (39) and John Bapst (39) rounded out the top five. The Greely Rangers took the team title on the girls' side, scoring 67 points, with York edging Belfast for the runner-up spot, 57-55, Cony (45.20) and Old Town (45) rounded out the top five. As they've done all 2018, Zach Westman and Jake Martin racked up a big chunk of points for the York Wildcats. 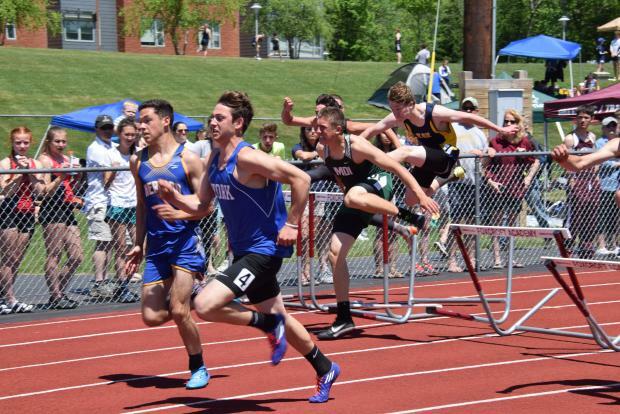 Westman defended his title in the 300 meter hurdles, running 40.24 seconds, finished second in the triple jump (42-04), third in the 110 hurdles (15.88), and fourth in the long jump (20-00.75). Martin didn't win any individual event but was the runner-up in the 110 hurdles (15.24), took third in the 300 hurdles (41.36), fourth in the high jump (6-02) and sixth in the long jump (19-10.25). Freshman Aidan Martin picked up a win in the javelin, throwing 159-11 feet. The MDI Trojans got contributions from several different athletes. Griffin Maristany won the 200 (23.12), finished third in the 400 (51.02) and ran legs on both the 4x400 relay (MDI won in 3:32.19) and the 4x100 relay (another win for the Trojans in 44.09). Maristany's time in the 400 is a PB. Croix Albee had a strong day for the Trojans as well, as he finished second in the javelin (157-02), discus (145-07) and shot put (53-08.75). Elijah Denning finished second in the pole vault (12-00), while Elijah Joyce took fourth in the 110 hurdles (15.97). The race of the day had to be the 400 meters, with Yarmouth's Tahj Garvey defending his title, winning in 49.71 seconds. Winslow's Max Spaulding was right behind in 49.77. Garvey's teammate, Luke Laverdiere, cruised to an easy win in the 1600, running 4:23.09 and winning by over 10 seconds. It was Laverdiere's third consecutive state title. Laverdiere followed that up with another easy win in the 3200, running 9:45.49. Laverdiere had the fastest 1600 and 3200 times of all classes. There was another close finish in the 800 with Cony's Travis Nickerson edging Brewer's Jon Donnelly, 2:01.84 to 2:01.94. Nicholas Dall of Waterville appeared to win but was later disqualified for stepping on white line. Zachary Beaton had a big day for Hermon. The junior won the 110 hurdles (15.17), finished second in the 300 hurdles (41.08), and took fifth in the triple jump (41-03.50). Brewer's Jacob McCluskey added to his title collection, as he won the discus, throwing 147-10 feet. His teammate, Garrett Graham, won the shot put, throwing 54-04.75 feet. The Greely girls' did a lot of damage in the track events. Carolyn Todd and Marin Provencher each finished second and third in both the 1600 (5:21.08 for Todd, 5:22.32 for Provencher) and 3200 (11:41.81 and 11:43.91). Provencher also ran a leg on the Rangers' 4x800 meter relay, which took third in 10:14.11. Todd ran a leg on the 4x400 relay, which took third in 4:22.36. In the field events, Elizabeth Brown won the high jump, clearing 5-00 for Greely, and Maggie McCormick finished third in the pole vault (9-00). 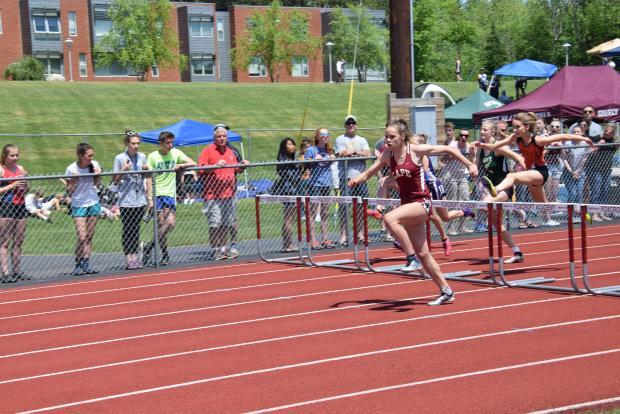 Cape Elizabeth's Darcy Cochran had herself a day as she won both the 100 hurdles (14.94) and the 300 hurdles (45.97). Her 300m hurdles time was the fastest of all classes. One of the premiere races of the day was the 100 meters. Leavitt's Nicole Daigle took the win in 12.56 seconds, with MDI's Ashley Anderson right behind in 12.59. Junne Robertson-McIntire of Belfast was third in 12.77, while Gray-New Gloucester's Madison Post took fourth, running 12.90. Robertson-McIntire would win the 200 in 26.67. Lily Horne of Freeport swept the 1600 and 3200 titles, running 5:13.28 and 11:17.84 respectively. Both times were the fastest of the day among all classes (and are also PBs). Oliviah Damboise of Old Town won both the triple jump (34-11) and the pole vault (10-00). Her mark in the pole vault is a PB. Sarah Cox of Waterville was another athlete who won multiple state championships, as she won the discus (118-09) and shot put (41-05.75). Both throws were PB's for Cox. The top three teams on the boys' side in Class C were separated by 10 points, but at the end of the day it was the Caribou Vikings taking the title, scoring 57 points. The Wells Warriors were the runner-ups with 54 points, while Traip Academy was third with 50. The Maranacook Black Bears were winners on the girls' side, racking up 103 points. Orono was second with 92.50 points, while Monmouth Academy (64), Wells (49) and George Stevens Academy (46) rounded out the top five. Evan Desmond was the one of the individual winners for Caribou, as he won the 1600 meter race walk, clocking 7:07.66. 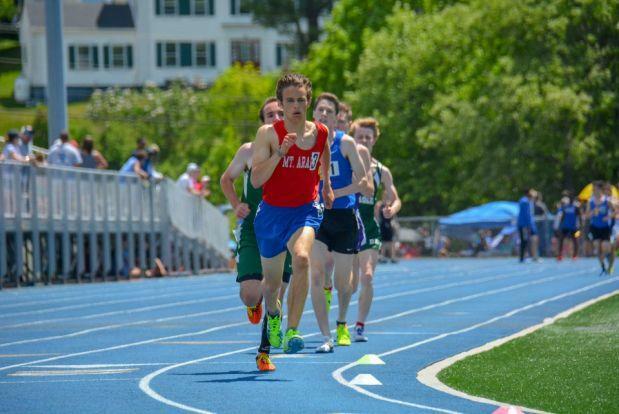 Desmond would also go on to finish sixth in the 1600, running 4:50.25. Evan Michaud and Cory Jandreau went 1-2 in the pole vault as they both cleared 12 feet. Griffin Allaire of Wells won the 1600 in 4:37.10. Allaire's teammate, Mitch Libby, took the 800 in a hotly contested race as he won in 1:59.41, with Traip's Dalan Hubbard right behind in 1:59.47. Those times were the two fastest of all classes on the day. Libby also won the 3200, running 10:26.46, and ran the anchor leg on the Warriors' 4x400 winning relay (3:37.79). Mattanawcook's Cayden Spencer-Thompson took titles in the long jump and triple jump, jumping 23-01.75 and 46-05 feet respectively. His mark in the long jump broke the state record formerly held by Ricky Thompson of MCI, who jumped 22-08.75 back in 1977. On the girls' side, it was Molly McGrail doing most of the damage for the Black Bears. McGrail won the 800 (2:27.46), was the runner-up in the 400 (58.97), took third in the 200 (27.27) and anchored Maranacook's 4x400 relay team, which finished fourth (4:32.45). Teammates Nicole D'Angelo and Janika Pakulski went 1-2 in the pole vault. D'Angelo cleared 10 feet, while Pakulski cleared 8-06. D'Angelo also won the shot put, throwing 35-03.50, whose clearance in the pole vault is a PB. Orono's Camille Kohtala won both the 400 (PB of 58.57) and 200 (26.79), and was the runner-up in the long jump (17-02.5). North Yarmouth's Olivia Reynolds took the 1600 and 3200 titles, running 5:14.45 and 12:33.67 respectively. Her time in the 1600 was particularly impressive considering it was pretty much a solo effort -- she won by more than 20 seconds. Penquis Valley's Cymeria Robshaw won both the long jump (17-07.75) and triple jump (34-10.5), while also taking third in the 100 (13.17) and eighth in the 200 (28.24). Her marks in the triple and 200 are PBs.